HIPAA news stories are sometimes so short we need to bundle them together. Some listeners questions are also addressed today. So, we have a little bit of everything in this episode. So stick with us as we go through our HIPAA hodge podge. Shut down open RDP ASAP!!!!!!! This is a known issue for some time now and attackers keep using this as a way in to get you. Please shut them down and find another way for remote access. Even if you think you have got this covered it really isn’t worth it anymore to assume that you do have it secured. The vulnerabilities in the tool along with so many weak credentials on networks out there, it is just not secure. Set up a real VPN solution that requires a client connection and then authentication again to get into the network. If a business associate (outside billing company) notifies us that a billing statement was sent to the wrong address, do we report that incident with the rest of ours for end of year, or does the BA report their own? Someone has to notify the patient and report to HHS it doesn’t really matter which one. Generally, the CE notifies the patient since you are ultimately responsible for that notification but you can have the BA participate as well. Are you a Covered Entity filing on behalf of your organization? Are you a Business Associate filing on behalf of a Covered Entity? Are you a Covered Entity filing on behalf of a Business Associate? You would select option 3 and they would select option 2. So, it doesn’t matter who does it as long as someone does it in a timely manner. Many BAAs now include language about how this will be handled. Using a popular cloud-based file sharing app that is billed as “secure”. They have free file sharing (low volume) and fee-based sharing (high volume). Is there any difference in fee based versus free for utilizing the same platform? What are the HIPAA considerations for using this if it’s billed as secure utilizing two factor ID access? All file sharing apps will tell you they are secure. Obviously, you get what you pay for when it comes to everything. However, when it comes to HIPAA you should not be using ANY file sharing app that doesn’t include a BAA between you and the vendor. 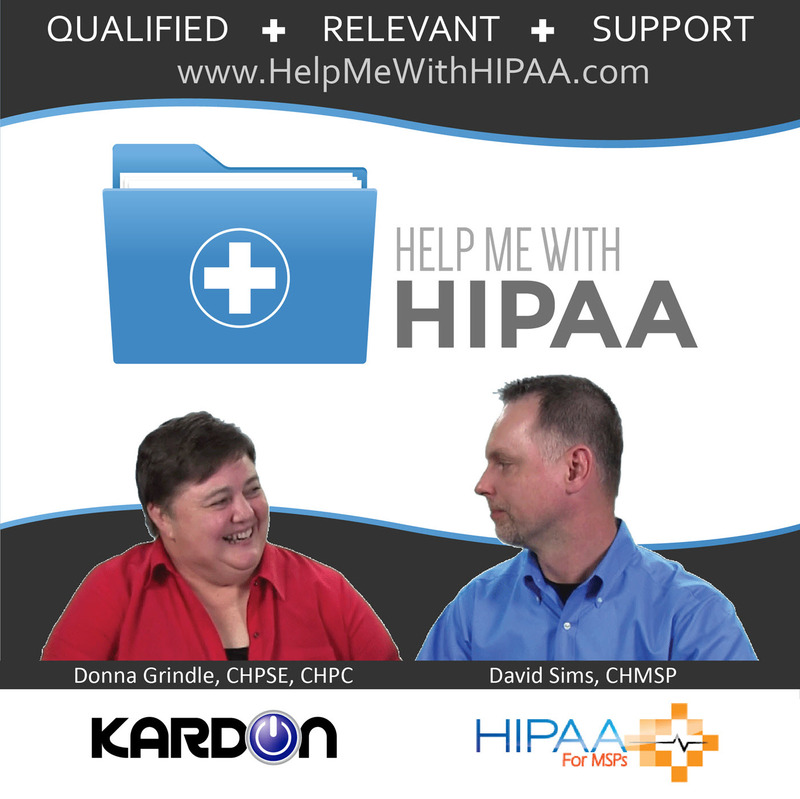 Listen to episode 80 https://helpmewithhipaa.com/hipaa-compliant-cloud-ep-80/ on cloud vendor compliance requirements. There should be no room for splitting hairs any longer on that requirement. Most of the big services will sign a BAA but only for a paid account and some of them only for the business paid account. I’m at the doctor, and was left in the room with ePHI and PHI left out in plain sight. I have my cell phone with me (doesn’t everyone? ), and could have very easily taken pics of patient PII and PHI. What should I do? Do I tell the clinic? This could have turned into a breach. Your experience is a common one for people who understand HIPAA. That was indeed a breach. Many people just ignore how big a problem this can be. In that situation, which I have been in before, I would snap a pic from an angle where you can’t read anything. Then, ask to speak to the privacy officer on my way out. I am always nice about it. I even tell them they can get free training from our podcast. I never try to sell my services, just try to protect my information. If they don’t respond accordingly then I have to find another provider. Technically, that should be evaluated as a breach for reporting to HHS. They may determine LoProCo based on how you handled it but it should be evaluated. What would you do if I came to you and told you this story? Suggestion to let tech savvy patients teach other patients about using portals and other tech like wearable device uses. What about HIPAA? – suggestion says invite all your patients and I will get up and tell them all how cool this tech is. You need me to spread the word and get more people involved in using your tech stuff is a great idea but…..
– They didn’t count at first but once they did start they got to 28 before someone could stop it. If you have concerns about how your doctor’s office handles your documents, you should call them. It’s also encouraged that patients do yearly credit checks. It’s all a reminder that your doctor has a role in both your physical and your financial health. – They been getting medical faxes since the summer of 2015. By 2017 he is all done. – More than 120 faxes between August 2015 and December 2016. Deleted first and now securing them. Guess what – moving an office to a new location and one employee was supposed to secure those documents but did not. All comes to light when the student who answered the ad saying she was interested in the work reported what happened. Having a whole show that is just a HIPAA hodge podge of information may not always be ideal but this one was pretty fun to put together similar stories. Who would think that multiple stories could blend together at least a little bit.